Professional wrestler John Cena’s former 2017 Ford GT, which wasn’t supposed to be resold for two years, has been resold a whopping five known times since he got the car a year ago. It most recently went on the block, again, and sold for around $1.3 million—a decent chunk less than it fetched last time. The final price on the GT at Mecum Dallas was $1.32 million, according to the auction house’s website, compared to the $1.435 million it sold for just over a month ago at a different auction in Monterey, California. At this rate, expect to see it for sale again next week. It, and the other GT making the rounds, have both effectively turned into big, expensive games of hot potato. Why? Good question. But Cena sold the car almost immediately, and it changed hands a known total of five times while Ford sued Cena and a dealer the car went to, New Autos Inc. in California, for breaking the agreement. 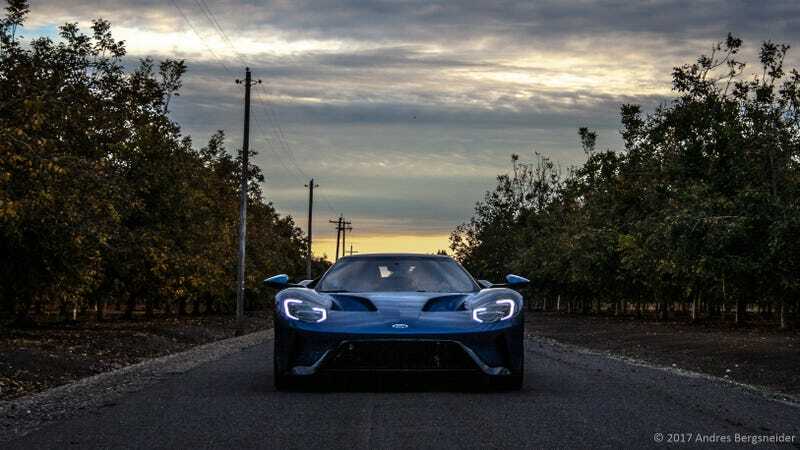 Both lawsuits were settled after about seven months, making Cena’s former car the first “unencumbered” current-generation Ford GT, as New Autos Inc. president Bernie Knaus told Jalopnik. So off to auction Cena’s GT went, heading to the Russo and Steele auction in Monterey. The car sold for nearly $1 million more than Cena paid for there, but was listed for sale again not long after. The car had 626 miles when it showed up in Dallas, according to the auction description, continuing a weird pattern of auction and re-auction that’s happening with both this car and another current-generation Ford GT. The other GT still has active cases in court, and sold for $1.65 million in May before fetching $1.6 million in August. But, you know, as old and tired as it gets to read and write about both of these cars being sold over and over again, it’s kind of motivational in a way. Next time you feel bad about yourself, like you’re getting tossed around more often than a beachball at a concert, just remember that things could be worse—at least you’re not a Ford GT. Correction: Wednesday, Oct. 10 at 9:33 p.m. ET: This story originally said the California auction was also a Mecum event, but it was Russo and Steele. There are too many Ford GTs hopping around auctions, but that doesn’t excuse our mistake. We regret the error.